Jaded Blossom: Jaded Blossom Monthly Spotlight & Design Team Member Announcement! Jaded Blossom Monthly Spotlight & Design Team Member Announcement! Happy 1st day of April!! 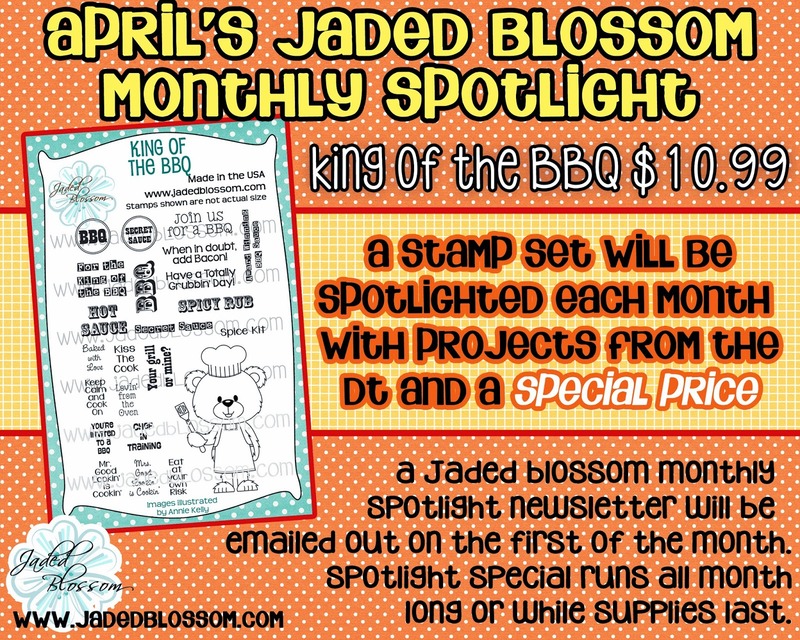 We have a new spotlight stamp set for this month.. King of the BBQ! You can get it this month for only $10.99!! We also have a new addition to our design team! Please join us in welcoming Candace Oliarny to the design team!! We are super excited that she has joined us and can't wait for you to see her amazing projects! Put it on your Calendar.. April Stamp Release starts Monday!! congrats Candace! Looking forward to seeing more of your projects! Congrats to Candace!! Can't wait to see your projects!